Bitter pills and strong tonics combine to make you feel much better. With no disrespect intended to the Neighbours; this album sounds less of a band offering and more a singer-songwriter coming of age; as the deep and slightly introspective songs will occasionally feel like a punch to the stomach then make you smile with recognition. MEDICINE opens with the delightful American Beauty which combines some intricate guitar picking with Holcomb’s distinctive voice on a gorgeous love song that includes the line “Her kiss felt like a loaded gun;” I mean…WOW….how cool is that? The singer’s delivery is always deceptively simple; but that only goes to mask some of the finest songwriting to come out of East Nashville in the last 10 years. If you scratch away the veneer you will find some of the most romantic songs you’ve ever heard and on Shine Like Lightning Holcomb isn’t afraid to blast out a powerful chorus and the melodies on The Last Thing We Do and Ain’t Nobody Got It Easy are worthy of daytime radio anywhere in the world. You have to wait a while for my favourite track to make an appearance but Holcomb’s duet and harmony’s with wife Ellie are well worth the wait; not only because it includes some amazing whistling; which isn’t something I ever expected to write! When It’s All Said and Done; which closes the album is a raw love song that judiciously uses a pedal steel half way through to emphasise the pain in his voice; before a climax that easily pushes the likes of Ed Sheeran and Sam Smith into the shadows. 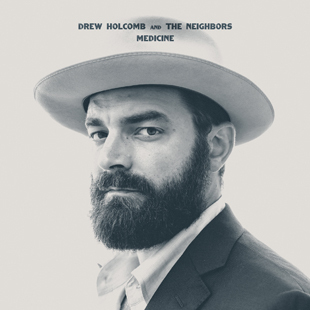 Unlike some of his contemporaries, Drew Holcomb has been hawking his act around the pubs and clubs for 10 years now; and MEDICINE just may be the vehicle to turn him into an overnight success.